You have a lot of hybrids with Hamata. I bought my first Hamata hybrid (Sibuyanensis x Hamata). Have you noticed any specific requirements? Since your Neps are indoors too what's your feeding preferences and schedule? Love to compare notes as I'm always open to learning more about these beautiful plants. 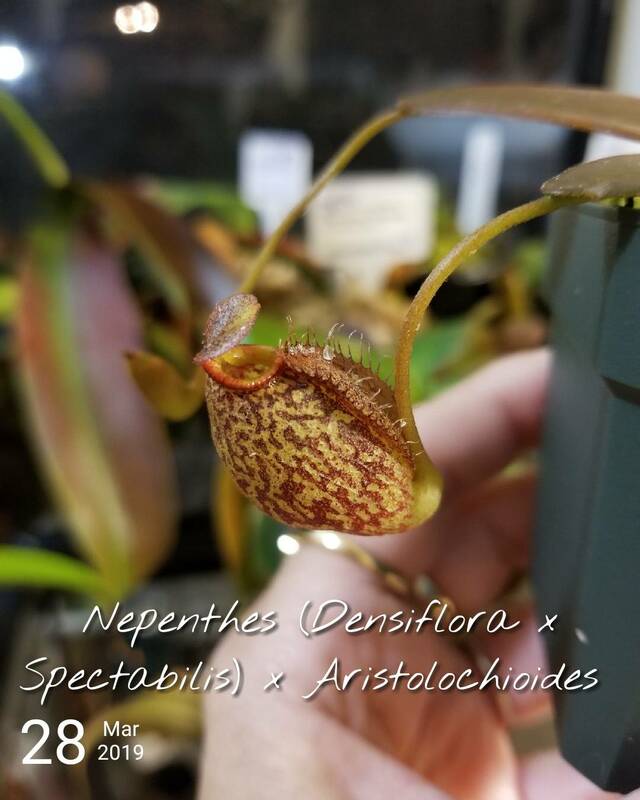 Right now I add an Osmocote pellet to new pitchers a la Peter D'amato, they help themselves to any hapless insects that dare to sneak in through cracks in my kitchen window (from the looks of my Drosera on my window sill right now it's carpet beetles ). I occasionally supplement my Neps with: freeze dried blood worms, betta mini pellets and/or live pinhead crickets. I also lightly mist my pitchers with highly diluted Maxsea twice monthly during Spring through Autumn and monthly during the Winter months. How about you? Last edited by javaliz59; 04-09-2019 at 06:16 AM. wasnt long ago that the tent had just a few little plants inside (seriously i have a problem) but thank you very much. i am halfway done with my new setup and will take me at least a year to fill that and need to find some other options. I like the hamata hybrids (of which I have but I so far) but also the Aristolochioides hybrids. 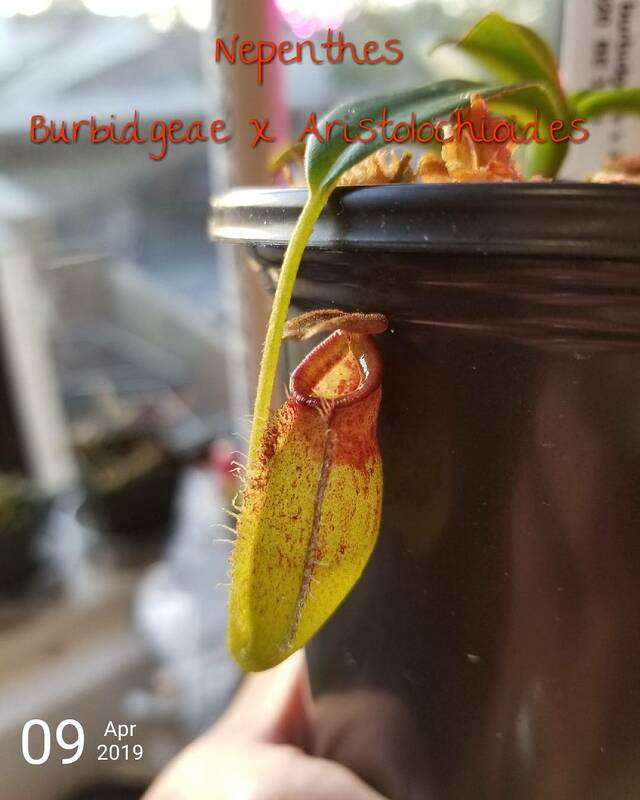 Speaking of which here's my newest little pitcher... Burbidgeae x Aristolochioides. Love the color. Doesn't have the hunchback like my (Densiflora x Spectabilis "Giant") x Aristolochioides) but I still love it. wow seems only the peristome carried over! I actually like that more than most aristo hybrids. i have an aristo x hamata inflating its first pitcher since acquiring it a couple months ago. very curious what it will look like! I purchased my Burbidgeae x Aristolochioides hybrid from Bergen Water Gardens. I'll message you with their website if you'd like. Super fast delivery and healthy plants. i order from them regularly, great place. i currently have about 50 plants on order between EP preorder, wistuba import and pearl river preorder. i will wait for them all to come and get situated before i even think about another addition.